Once Eclipse is installed and configured, we are ready to install FusionDebug using the Eclipse Install New Software Manager. This will download, check and install the FusionDebug package, and makes upgrading FusionDebug easier in the future. This guide has been written using Eclipse Kepler 4.3. Please note that the process may be different if you are using a different version of Eclipse. In Eclipse, select Help -> Install New Software to begin the process. This activates the Install dialog, shown in Figure 12. 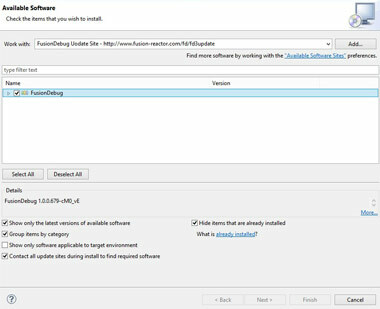 In the Install dialog, ensure FusionDebug is selected, then click Next. The Software Manager will connect to fusion-reactor.com and locate the new software. A Install Details dialog will appear, similar to that pictured in Figure 13. Review the installation and click Next. Read the license agreement which appears in the next step, and if you accept its terms, select I accept the terms of the license agreement and click Finish to complete the process. When the Security Warning dialog appears, click OK.
Eclipse will ask if it should restart the Workbench. Answer Restart Now to this question. Eclipse will restart automatically.